Welcome to the New Forest Visitor Map from Merritt Cartographic, an interactive tourist and visitor map of the New Forest National Park. Zoom in to reveal more detail and click on features to display additional information. The main focus of this map is to provide information for visitors to the New Forest National Park in Hampshire, UK. As well as identifying a wide range of popular tourist and visitor attractions, this map highlights the most popular locations to participate in a wealth of leisure activities, including, amongst many others, walking and cycling, fishing, dog walking, golf, kite-flying, photography and watching wildlife. This interactive map shows the location of all the numbered route marker posts on the New Forest off-road cycle network. The New Forest is situated in southwest Hampshire between the cities of Southampton and Bournemouth. The forest was founded primarily as hunting ground by William the Conqueror more than 900 years ago. The New Forest contains some of the UK's rarest wildlife habitats and is the largest surviving area of ancient pasture woodland in western Europe. 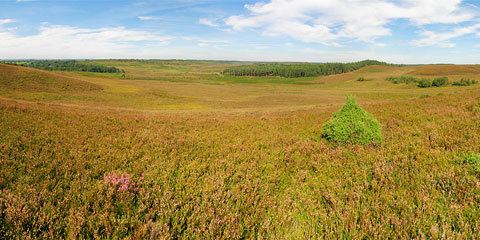 Despite the name, nearly half of the New Forest SSSI is comprised of heathland. The mosaic of woodland, heathland and lowland mires (of which there are nearly 100 in the forest) on the scale as seen here is unique to the New Forest within the UK. 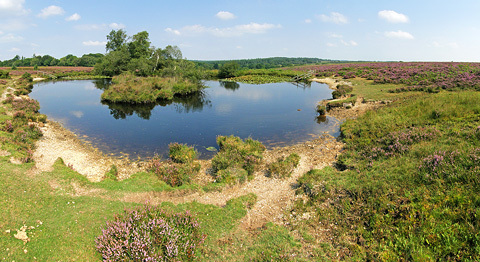 The New Forest region is bordered by a coastline which in itself contains many nationally important habitats, comprising primarily saltmarshes and mudflats. The New Forest was established as a National Park in 2005. The appearance of the modern forest is due at least in part to the ancient traditions of commoning still very much in practice on today's landscape. The rights of commoners (land owners within the forest) to graze their livestock (primarily ponies, cattle and pigs) within the forest helps to maintain the equilibrium between woodland and the more open landscapes and prevents certain areas from returning to a fully forested environment. However, it is the work of the Forestry Commission, who manage nearly half of the land within the National Park, that ensures the special environments found here are maintained for future generations to enjoy. Without their work and that of a range of other organisations, including the New Forest National Park Authority, I am under the impression that these environments would be very much under threat from the ever increasing pressures of tourism and human development. Having created this map, I am keen to point out the advice given here by the New Forest National Park Authority in terms of helping to care for the forest and the environments found within it. 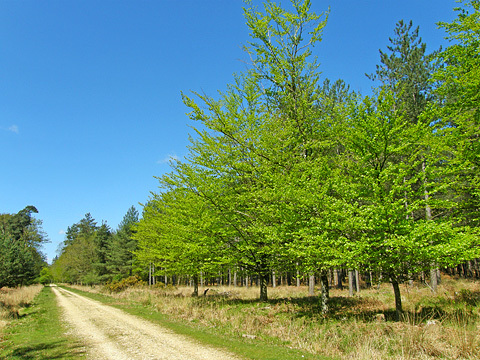 The New Forest is one of the richest places in the UK in terms of its biodiversity. I have attempted, on this map, to locate the areas that are widely regarded as being amongst the best places to see the wildlife and livestock of the forest and wider region. Locations identified as being potentially good places to see the forest's wildlife and livestock are highlighted with a range of illustrative symbols. A full guide to the symbols used can be found in the map key. Symbols on the map marked with a star can be especially productive in so much as they are either located in areas widely regarded as being amongst the best locations to observe the noted species or special measures have been put in place to encourage and protect the wildlife found in these areas. In addition to my own data gathering and field surveys, carried out over the last few years, I am indebted to the authors of the following books, journals, reviews and websites, listed below, without whose expert knowledge this task would have been much more difficult. Combining my own data with information gathered from these sources, I have attempted to create an overview of the best locations to see the forest's wildlife and livestock. BirdForum - New Forest (2013) http://www.birdforum.net/opus/New_Forest. Brock, P. D. (2011) A Photographic Guide to Insects of the New Forest and Surrounding Area, Newbury, Pisces Publications. Brooks, S. (2004) Field Guide to the Dragonflies and Damselflies of Great Britain and Ireland, Gillingham, British Wildlife Publishing. Butterfly Conservation Dorset Branch (2013) http://www.dorsetbutterflies.com/. Butterfly Conservation Hampshire and Isle of Wight Branch (2013) http://www.hantsiow-butterflies.org.uk/. Clarke, J. M. and Eyre, J. A. (1993) Birds of Hampshire, Hampshire, Hampshire Ornithological Society. Green, G. and Cade, M. (2010) Where to Watch Birds in Dorset, Hampshire and the Isle of Wight (Fourth Ed. ), London, Bloomsbury Publishing Plc. Hampshire & Isle of Wight Butterfly & Moth Report 2008 (2009), Basingstoke, Hampshire and Isle of Wight Branch of Butterfly Conservation. Hampshire & Isle of Wight Butterfly & Moth Report 2009 (2010), Basingstoke, Hampshire and Isle of Wight Branch of Butterfly Conservation. Hampshire & Isle of Wight Butterfly & Moth Report 2010 (2011), Basingstoke, Hampshire and Isle of Wight Branch of Butterfly Conservation. Hampshire & Isle of Wight Butterfly & Moth Report 2011 (2012), Basingstoke, Hampshire and Isle of Wight Branch of Butterfly Conservation. Hampshire Bird Report 2008 (2009), Hampshire, Hampshire Ornithological Society. Hampshire Bird Report 2009 (2010), Hampshire, Hampshire Ornithological Society. Hampshire Bird Report 2010 (2011), Hampshire, Hampshire Ornithological Society. Heathcote, T. (1997) Discovering the New Forest: The Complete Guide, Tiverton, Halsgrove. Inns, H. (2009) Britain's Reptiles and Amphibians, Old Basing, WILDGuides Ltd.
New Forest Local Group - The Royal Society for the Protection of Birds (2015) http://www.rspb.org.uk/groups/newforest/. Overton, D. (2015) Dragonflies and Damselflies of the New Forest: http://www.newforestdragonflies.com/. Reptiles & Amphibians of the UK (2015) http://www.herpetofauna.co.uk/. Ritchie, P. (2015) Hampshire Dragonflies: http://www.hampshiredragonflies.co.uk/. Sibley, P. and Fletcher, R. (1986) Discovering the New Forest, London, Robert Hale Ltd.
Snook, A. M. (1998) Birds of the New Forest: A Visitor's Guide, Fordingbridge, Centurion Books. Sterry, P. (1995) Regional Wildlife: New Forest, Dial House. Taverner, J., Cham, S and Hold, A. et al. (2004) The Dragonflies of Hampshire, Newbury, Pisces Publications. The Progress Project (2006) New Forest Wading Bird Survey, Forestry Commission. Thornbury, A. (2015) Alan Thornbury's Hampshire Butterflies: http://www.purple-emperor.co.uk/. Walford, M. (2015) Going Birding? : http://www.goingbirding.co.uk/. Whitaker, J. (1997) A Field Guide to the Scarcer Breeding Birds of the New Forest and Surrounding Area, Leeds, Peregrine Books. Wild About Britain (2015) http://www.wildaboutbritain.co.uk/. Wildlife & Wild places (1996), Curdridge, Hampshire & Isle of Wight Wildlife Trust. Wildlife & Wild places (2013), Curdridge, Hampshire & Isle of Wight Wildlife Trust. Winter, P. (2015) Localpatch: https://sites.google.com/site/localpatch/. Winter, P. (2015) Patchwatching: http://patchwatch.blogspot.co.uk/. I am hopeful that, over time and as more information becomes available, I will be able to add further wildlife information to this map. I'm also more than happy to revise any existing information that may currently be either inaccurate or out of date. Please let me know if any of the icons that I have placed on the map are incorrect or if they could be be positioned differently to better reflect the distribution of the species noted. Thank-you for your help. Many of the species of wildlife found in the New Forest are in decline nationally and, generally speaking, a number of the sites highlighted on this map are home to species which are particularly sensitive to human disturbance. Any wildlife encountered either at the locations noted on this map or throughout the region in general should be treated with due care and respect. Please take care to avoid disturbing or damaging these sensitive environments and the wildlife found within them. For further information relating to the New Forest's wildlife and advice with regard to the protection of the habitats found here, please visit the relevant pages on the New Forest National Park website here. The New Forest has something for everyone and is, therefore, a very popular destination for visitors and tourists. For that reason there is a large amount of useful information available online covering all aspects of the New Forest. The following list highlights some of the many excellent websites which provide information about the New Forest and the locations found within it. In addition to those noted in the sections above, the following resources were consulted during the compilation of this map. Branson, J. (2007) The Progress Project: Survey of off-road cycling, Southampton, GeoData Institute. Moore, B. (2007) A Year in the Life of the New Forest, London, Frances Lincoln. Ponting, G. (2000) Landmark Visitors Guide: New Forest, Landmark Publishing Ltd.
New Forest District Deer Management Plan (2005–2015) (2007), Forestry Commission. The Progress Project (2005) New Forest Dog Study, Forestry Commission. The Progress Project (2005) New Forest Horse Riding Study, Forestry Commission. Tubbs, C. R. (1986) The New Forest: A Natural History, London, Collins. Merritt Cartographic creates custom-made interactive maps and content, like this, to meet the requirements of your design brief. If you need an interactive map designed for your project, please let me know. This map has been built in part with open data. Over time, as more or better information becomes available, I hope to add to this map and, more importantly, correct any errors or inaccuracies that are currently present. Please help me to make this map better by informing me of any errors that you notice. If I have omitted something that you think should have been included, please tell me. Thank-you for your help. Data for this map has been sourced from the OpenStreetMap project. This map also makes use of OpenData from the Ordnance Survey as well as a number of other datasets released by the UK Government through the Open Government Licence. Many of the photographs used across the map have been obtained from the Geograph® Britain and Ireland project. Map data © OpenStreetMap contributors. Contains Ordnance Survey data © Crown copyright and database right 2018. Contains public sector information licensed under the Open Government Licence v2.0. An index of the New Forest's most popular tourist and visitor attractions. Navigate directly to these locations by clicking on the names below. A list of the New Forest's campsites, caravan sites and holiday parks. Navigate directly to these locations by clicking on the names below. A list of the New Forest's Forestry Commission car parks. Navigate directly to these locations by clicking on the names below. A list of the New Forest's Forestry Commission cycle route marker posts. Navigate directly to these locations by clicking on the names below. A list of the New Forest's waymarked walking routes. Navigate directly to these trails by clicking on the names below. Ice cream van (popular location)! These are locations identified as being potentially good places to see the following wildlife and livestock. Symbols marked with a star can be especially productive in so much as they are either widely regarded as being amongst the best locations to observe the noted species or special measures have been put in place to encourage and protect the wildlife found there. Please show due care and respect to any wildlife encountered.